Catching rough fish by seine net was only the start of the harvest and sale operation. Once caught, fish had to be sorted, kept alive in pens, boxed, trucked, and shipped to their final destination. Barge with seine rope. Note the pulling engine on the right bringing in the long seine net. 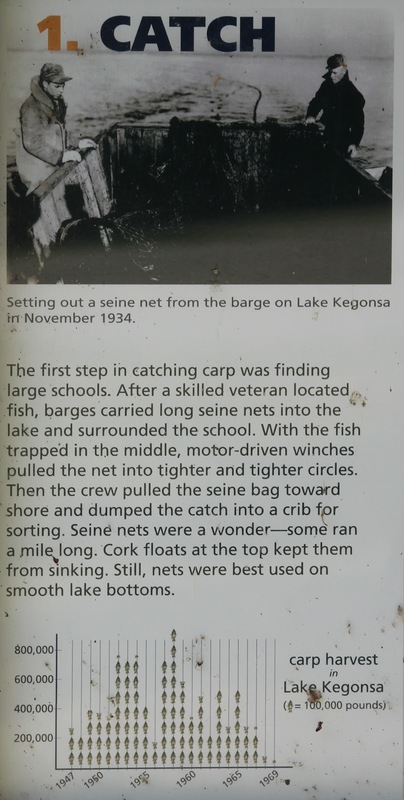 Setting out a seine net from the barge on Lake Kegonsa in November 1934. The first step in catching carp was finding large schools. After a skilled veteran located fish, barges carried long seine nets into the lake and surrounded the school. With the fish trapped in the middle, motor-driven winches pulled the net into tighter and tighter circles. Then the crew pulled the seine bag toward shore and dumped the catch into a crib for sorting. Seine nets were a wonder--some ran for a mile long. Cork floats at the top kept them from sinking. Still, nets were best used on smooth lake bottoms. Running carp into the fish crib directly from the seine net. Game fish are hand-netted and released, as in the left foreground. The crib, a combination barge and 60-foot-long wooden crate, had doors on both sides. These could be opened to receive the catch from seine nets. In the crib, the crew sorted out game fish, such as walleye, bass and pike, to return to the lake. Bigmouth buffalo fish, a non-game fish with superior taste, were the most valuable fish and sold separately for 25-50 cents per pound (1950s prices). That compared to less than 10 cents for carp. Bigmouth buffalo was the most desired non-game fish. Crating carp for shipment. Each box held 200 pounds of fish. In the background is the holding pen. Private buyers arrived at McFarland Fish Camp by truck to pick up carp directly. On many Saturdays, the Fish Camp crew tucked carp to railroad stations in Madison and Janesville. 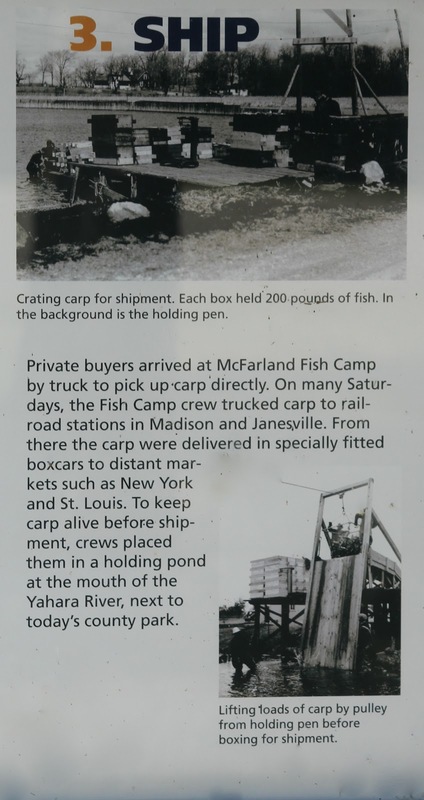 From there the carp were delivered in specially fitted boxcars to distant markets such as New York and St. Louis. 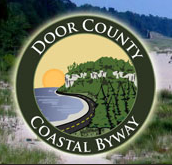 To keep carp alive before shipment, crews placed them in a holding pond at the mouth of the Yahara River, next to today's county park. Lifting loads of carp by pulley from holding pen before boxing for shipment. 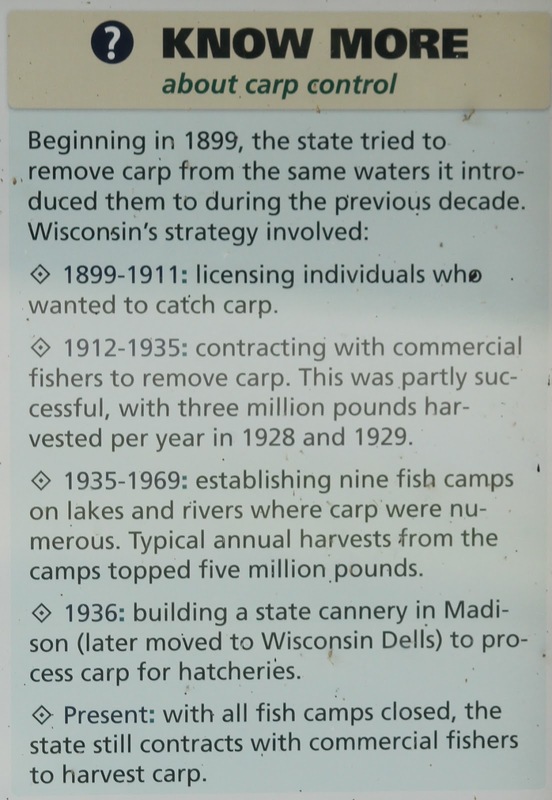 ✥ 1899-1911: licensing individuals who wanted to catch carp. ✥ 1912-1935: contracting with commercial fishers to remove carp. 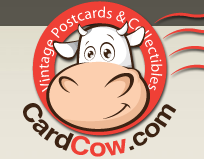 This was partly successful, with three million pounds harvested per year in 1928 and 1929. ✥ 1935-1969: establishing nine fish camps on lakes and rivers where carp were numerous. Typical annual harvests from the camps topped five million pounds. 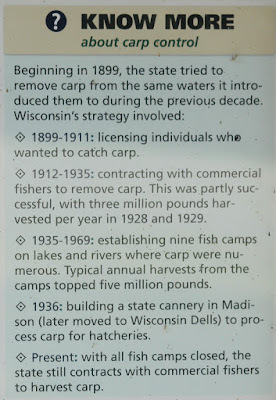 ✥ 1936: building a state cannery in Madison (later moved to Wisconsin Dells) to process carp for hatcheries. ✥ Present: with all fish camps closed, the state still contracts with commercial fishers to harvest carp. 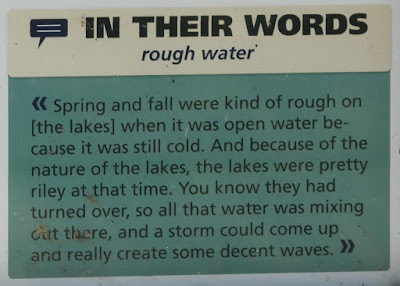 "Spring and fall were kind of rough on [the lakes] when it was open water because it was still cold. 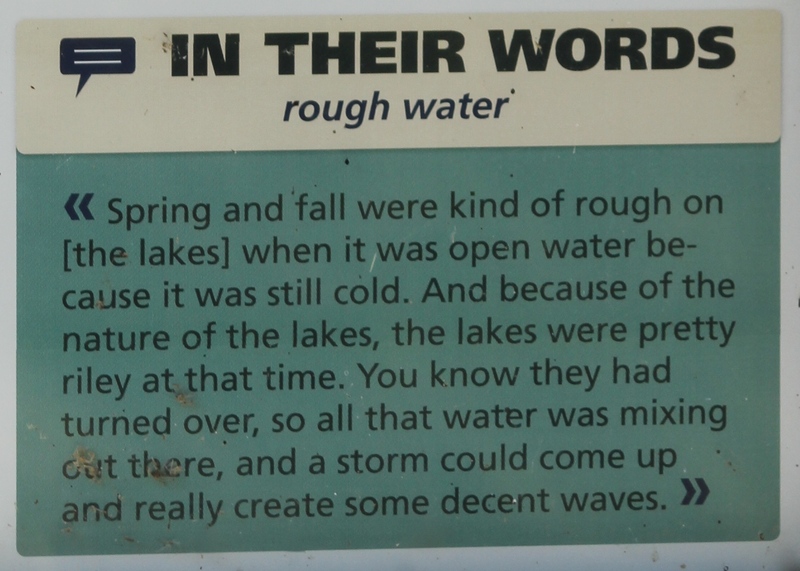 And because of the nature of the lakes, the lakes were pretty riley at that time. You know they had turned over, so all that water was mixing out there, and a storm could come up and really create some decent waves."